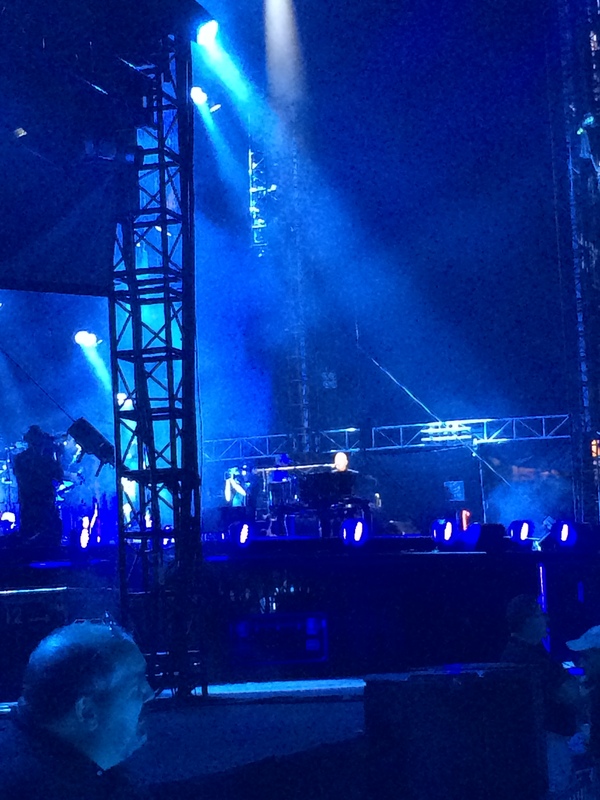 Billy Joel hasn’t been around Philly since his 2009 face-to-face tour with fellow piano man Elton John. Packing a stadium certainly is not easy, but Joel makes it look like a piece of cake. With a show that sold out almost immediately after going on sale, no one in that audience should have left disappointed. Billy Joel awarded the City of Brotherly Love with an astounding show filled with countless hits. The lights went down on the 50,000 people seated in Citizens Bank Park, and the anticipation was palpable. Everyone was on their feet immediately, and it was hard to believe that the man about to take the stage was not some 21st century hit-maker. Despite not releasing an album since 1993 (something about which Billy Joel joked), the songs sounded as fresh as ever. Playing rhythm guitar, something very nice to see as it gives Joel more of a chance to interact with the crowd, the show opened up to “A Matter of Trust.” It was easy to tell from the first notes that the crowd in Philly was a dedicated one. While a Miley Cyrus concert was taking place across the street at the Wells Fargo Center, Joel epitomized longevity. The crowd sang along, even to the deep cuts, nothing like the audiences for most of the hit-makers today. Joking about not being in Philly since his 2009 show with Elton John, Joel referred to him as the “other guy” and proceeded to play a snippet of the beautiful “Your Song,” halting at the lyric, “Don’t have much money, but…” to exclaim that he does, in fact, have plenty of money. He certainly seemed to have a great sense of humor. A bit later, Joel did something pretty interesting in letting the audience choose what song he was to play next. Gauging what song got a louder cheer between “Summer, Highland Falls” and “Vienna,” the latter was the clear winner. What a great song that Joel delivered with an impassioned performance. He really has lost very little as far as his voice goes. I saw Elton John back in November, and I honestly believe that Joel’s voice blows his away these days. Next up was an awesome version of “Zanzibar” preceded by the mandatory “Theme from Rocky.” Very few numbers get a Philly audience so filled with pride for their wonderful city. Always one to have a few surprises up his sleeve, Joel introduced Philly-based act Boyz II Men, leading into a performance of the rarely played “The Longest Time.” The harmonies of Boyz II Men sounded great blended with Joel’s vocals. Back to back hits filled the stadium next, with amazing renditions of “New York State of Mind” and the infectious groove of “Movin’ Out (Anthony’s Song).” The latter sounded even greater fleshed out with the whole backing band. It must be noted that the band Joel brought with him was fantastic and really helped add to the great feel of the night. Up next was a moving rendition of “Goodnight Saigon” with American veterans. The crowd could not stop cheering for the brave heroes up on stage, and I believe that it is a true testament to Joel’s great character that he brought them up on stage with him. Hit after hit continued to fill the night, with a particularly beautiful version of “She’s Always a Woman.” Billy Joel’s voice truly has remained remarkably intact through the years. Introducing guitar tech Rick, Joel picked up his guitar once again as Rick belted out the AC/DC classic “Highway to Hell.” The audience was thrilled by this song choice (especially the drunk guy a few rows behind me playing air guitar like nothing I have ever seen)! “Scenes From an Italian Restaurant” was another amazing performance; the story that Joel tells through the lyrics is just amazing. They just don’t write songs like this anymore! Everyone in the crowd was brought back to Brenda and Eddie’s affair in the summer of ’75. The main set was closed out with the classic “Piano Man,” which had 50,000 people singing along at the top of their lungs. Joel continued with a whopping five song encore, starting off with the hit “Uptown Girl,” which certainly made many in the audience think back to the wonderful video with the gorgeous Christie Brinkley. Joel looked so young in that video! “It’s Still Rock and Roll to Me” and “Big Shot” were up next, to roaring receptions from the greatly enthusiastic crowd. “Big Shot” has always been a personal favorite of mine, and Joel certainly did it justice. A great performance of “You May Be Right” was next, with the show being rounded off with the amazing “Only the Good Die Young,” Going to a Billy Joel show leaves a concertgoer astounded by the sheer amount of hits that Joel has had throughout his career. The one song I admit that I would love to have heard would have been “The Stranger,” but I really can’t complain about such a phenomenal show. Billy Joel does not play too many shows these days, seemingly preferring to stick with his “residency” up at Madison Square Garden. Bearing this in mind, it really was an honor to see such a great talent perform, and I truly hope that I get the opportunity to experience it again. If Billy Joel comes to your area, I implore you to go see him – you certainly will not regret it! On another note, I got the chance to meet Tony Luke Jr. of cheesesteak fame at the show; he was an extremely nice guy!